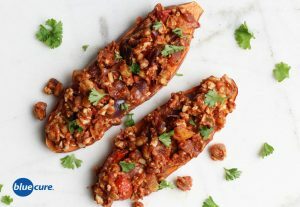 Tempeh Joes are a lighter, healthier spin on traditional sloppy Joes. Packed with plant-based proteins and antioxidant- rich sweet potatoes; this kind of Joe is sure to leave you feeling satisfied. Tempeh is a fermented soybean product that is packed with protein and adds a “meaty” texture to the dish. The sweet potatoes and red onion add sweet notes to the meal. Serve the Tempeh Joes as the main course or use smaller sweet potatoes to make them into appetizers. Preheat the oven to 450F. Wash the potatoes and carefully cut lengthwise into long, thin strips (about ¼-½ inch). Bake for 10-15 minutes in the oven, or until desired texture. Flip them halfway through. Wash and chop the veggies. Saute the onion in 1-2 tablespoons of water. Once the onions start to become translucent, add in the tempeh. Using the spatula, start to break the tempeh into smaller pieces. Add more water as needed to keep the veggies from sticking to the pan. Add the pepper and the tomatoes to the pan with the tempeh. Continue to saute until the veggies reach desired texture. Add the tomato paste, ½ – ¾ cup water, garlic powder, chili powder, turmeric, black pepper, and prepared mustard to the pan. Stir until well combined. Cook on medium-low heat until desired temperature and taste. If adding cauliflower rice, mix in near the end of cooking so it retains it’s crunchy texture. Serve the tempeh joes on the sweet potato toast with greens. Enjoy!